BROWNSBURG, Ind. (April 8, 2019) – Tony Stewart’s Ollie’s Bargain Outlet All Star Circuit of Champions presented by Mobil 1 will kick off the 2019 championship point season in a big way, set to headline four events in four days throughout two states with three of the events spread across the competitive region of Central Pennsylvania. The traveling All Stars, complete with 15 full-time teams vying for the season-ending point fund, will battle for a total winner’s share equalling $27,000 over the course of the four-day weekend, opening with the $10,000-to-win/$1,000-to-start, Thursday Night Thunder showstopper at the state-of-the-art Virginia Motor Speedway in Jamaica, Va., on Thursday, April 11. Once action at Virginia Motor Speedway is complete, the All Star Circuit of Champions will turn their compasses north and cross the Mason-Dixon for a three-pack in the Keystone State beginning with the Tommy Hinnershitz Memorial Spring Classic at the world-famous Williams Grove Speedway on Friday, April 12. Despite a long history in Pennsylvania Posse Country, the All Stars have yet to earn a victory during competition at The Grove. Full-time competitors will have 6,000 reasons to end the infamous streak on Friday night, as the Hinnershitz will award a $6,000 payday. Competition will resume with the annual Keith Kauffman Classic at Port Royal Speedway on Saturday, April 13. 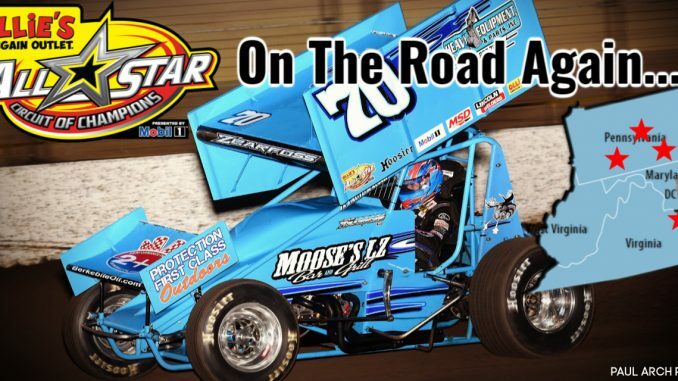 The $6,000-to-win program, honoring ‘The Man From Mifflintown’ who owns over 300 victories and 18 track championships over the course of his career, will be the first of three ‘Speed Palace’ appearances by Tony Stewart’s All Stars in 2019. The Series will return in September for the two-day Tuscarora 50, which will award an unprecedented $52,000 payday on Saturday, September 7. The four-race weekend will come to a close with a visit to the historic Bedford Fairgrounds Speedway on Sunday evening, April 14. Although a short history with the traveling sprint series in terms of overall appearances, six total visits since the Series first visited Bedford in 2001, Bedford Speedway has been nothing short of competitive, as six different winners have been crowned in the first six contests. Tony Stewart, who his celebrating his fifth season as the commander-in-chief of the All Star Circuit of Champions, will not only make an appearance at Virginia Motor Speedway on Thursday evening, but the three-time NASCAR Cup Series champion plans to join-in on the action, vying for the five-figure payday and another win to add to his ever-growing open wheel resume. Speed Shift TV, the official online broadcast partner of the Ollie’s Bargain Outlet All Star Circuit of Champions presented by Mobil 1, will be on hand to capture the entire four-race weekend. Fans seeking information regarding viewing options including Speed Shift TV’s VIP subscription can do so by visiting Speed Shift TV live on the Web at www.speedshifttv.com. Virginia Motor Speedway in Jamaica, Va., will open pit gates at 4 p.m. on Thursday, April 11. The mandatory All Star drivers meeting will begin at 5:45 p.m., followed by hot laps at 6:30 p.m., sharp. Fans seeking additional news and notes can do so by visiting Virginia Motor Speedway live on the Web at www.vamotorspeedway.com. Williams Grove Speedway in Mechanicsburg, Pa., will open pit gates beginning at 5:30 p.m on Friday, April 12. A drivers meeting will be conducted at 6:30 p.m., followed by hot laps at 7. Fans in need of more information should visit Williams Grove Speedway online at www.williamsgrove.com. The Port Royal Speedway ‘Speed Palace’ in Port Royal, Pa., will open pit gates at 3 p.m. on Saturday, April 13. The mandatory drivers meeting set for 4:45 p.m. will be followed by hot laps at 5:30 p.m. More news and information can be found online at www.portroyalspeedway.com. Bedford Speedway in Bedford, Pa., will swing open pit gates beginning at 4 p.m. on Sunday, April 14. An All Star drivers meeting will be conducted at 5:30 p.m., followed by hot laps at 6 p.m., sharp. Those wanting to learn more should visit Bedford Speedway live on the Web at www.bedfordspeedway.com.